Last week I got an email from reader Matt Chroust who recently became (or at least tried to) an Insteon HomeKit early adopter. While he didn’t spend much time with the setup, his experience did not sound like a good one. It’s pretty clear that the third-party products ISY-994i and MobiLinc are still the hands-down leaders in the Insteon space. Speaking of, I’m excited to see the new firmware for the ISY and the latest version of MobiLinc with HomeKit support – both of which I’ll be reviewing in these pages in the coming weeks! I was an early adopter in the Smart Home market, having installed various X-10 devices in my home back in the late 80s. X-10 technology promised benefits of remote control of appliances, lighting, and as more products became available, the capabilities grew to include thermostat control and alarms. 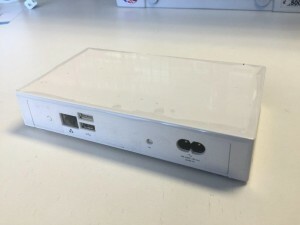 I even installed an X-10 stand-alone hub that connected directly to a television and would run programs to control thermostats and lighting, or randomly actuate lights around the house to give the house a lived-in appearance when I was away. There were some basic problems, however; the technology was notoriously unreliable and there was no feedback loop to ensure that the instructions to turn on a light or switch off an appliance were actually completed. X-10 had an infrared sensor that remotely actuated a speaker that played an electronic recording of a barking dog when someone approached the front door. It was a little unreliable, and gimmicky, but it whet my appetite! Then, SmartHome’s Insteon technology became available. Its dual-band technology relies not on not just the house wiring but also uses radio to communicate between devices and creates a mesh network that becomes more reliable as more devices are added. 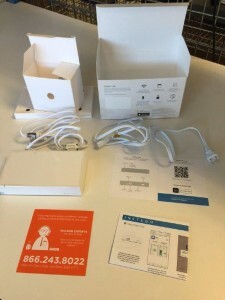 In effect, every Insteon device becomes a repeater on the network. I installed dimmer modules on overhead soffits and track lighting and used the 8-button KeypadLinc modules to create scenes that would set things up with appropriate task lighting, entertainment or just enough light for nighttime navigation. Moreover, individual KeyPadLinc sets could be interfaced throughout the house so they would show the state of other switches at a glance. It’s a very sophisticated and powerful system. The only real problems I had emerged a year or two later, when some of the modules began burning out. Aside from the cost of replacement, the process of reprogramming can be very time consuming and the replacement of a single module left its surviving partners issuing ghost codes to the dead module repeatedly, making the system increasingly unreliable. I also found the dimmer modules were not really compatible with dimmable LED lights, which issue a lot of RF interference on their own. But when things worked it was sweet! I have fan controllers, switch interfaces, an ISY-994i controller and even smoke alarms interfaced in my whole-home system. It’s great being able to activate living room lighting from a bedside module or put the whole house to sleep from the front door when I leave. 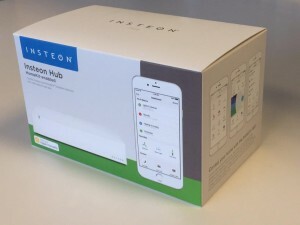 Fast forward to just a few months ago when Insteon announced they would offer a new hub capable of interfacing existing Insteon devices with Apple’s HomeKit technology, basically creating a bridge on the network that a homeowner could use to issue voice commands to control lights, temperature and even entire scenes via Siri using Apple’s voice recognition technology. It was an exciting idea, but there were some long development delays as Apple delayed its own HomeKit activities. I plunged in anyway, and ordered an Insteon HomeKit enabled Insteon Pro Hub and waited. Then I waited some more. After two months had gone by without any news, I emailed Insteon. They said they were backordered through end of September and offered to cancel my order. 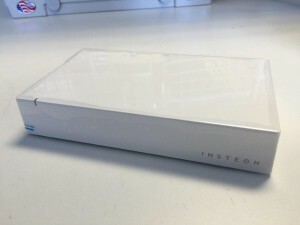 In retrospect I wish I had, but just two days ago the Insteon package containing the Pro Hub arrived, containing the hub, a short setup card and AC power and Ethernet cables and I excitedly went through the setup instructions. … but the back has ports for the two cables, SET and RESET buttons and a couple of USB ports. Unfortunately, nothing really worked as described. The Insteon+ App downloaded OK but wouldn’t see the hub on the network. I tried the manual linking process by pressing the Set button on the back of the hub and after a short time, the hub appeared listed on the bottom of the App screen, but twice! I selected one of the two and gave it a custom name. Next, I tried to link in my Insteon devices, beginning with a keypad, but no matter how many times I tried or how close the keypad was, it just couldn’t be seen. The Insteon+ app actually requires that you enter the 6-digit Hex ID of the device before you can link to it. It is unable to recognize Insteon devices by the the communication activity occurring on the AC power line or RF. I moved the keypad closer and even placed it directly on top of the hub, but it still wouldn’t be seen. 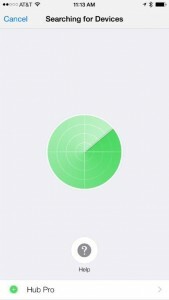 During its searches the Inteon+ app times out and just shows a sweeping radar animation. 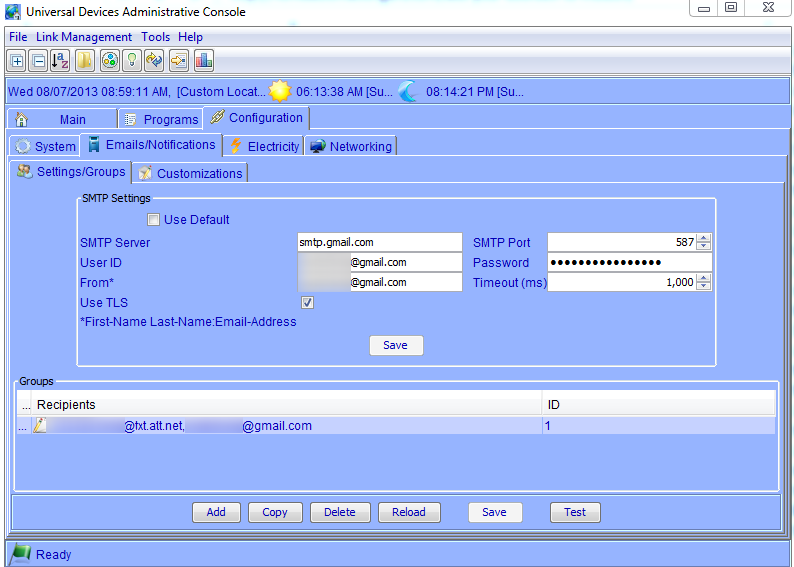 There’s no way to interrupt and no way to get any diagnostic inputs. I can’t imaging having to open every Insteon controlled switch and socket in the house and pull out the electronics so I could figure out the 6-digit code. 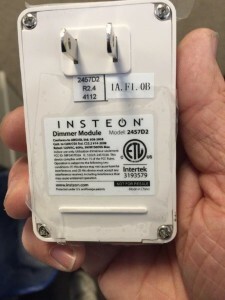 It’s easy to read the hex codes from Insteon’s Lamp and Appliance Modules, but very hard to access hard-wired Insteon hardware. Discovery should be automatic! While I was waiting I read the iTunes feedback on the Insteon+ app and found twelve one-star reviews and just one four-star review. Many of the single star reviewers complained of exactly the same problems I had seen. 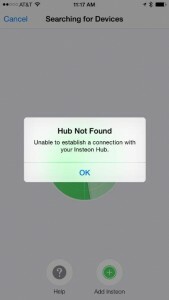 One user was able to connect some 50 Insteon devices to his hub, but had a crash that set him back to ground zero. Ultimately, after spending another half hour with this and getting nowhere with my installation, I gave up and packed up the device for return. It’s pretty clear that after 25 years, I’m back on the bleeding edge of home automation! 1 Pings/Trackbacks for "Insteon HomeKit not quite ready for prime time"